The image of a young dark-haired woman, dressed in a blue sweater and lying face down on his garden hedge, is one that for Peter Giesecke not even 30 years can diminish. Minutes before his torch beam drew his startled gaze to her lifeless figure in the darkness outside, he had been watching Michael Aspel's This is Your Life on television, when a deep rumbling sound had drawn him to the window. Unaware of the hell about to unleash itself on the town of Lockerbie, Dumfriesshire, on 21 December 1988, he watched perplexed as a bright light - the broken remains of Pan Am Flight 103 - fell from the sky. The aircraft had taken off just half an hour earlier from London Heathrow and was on its way to New York with 243 passengers and 16 crew on board, when a Semtex bomb hidden in a suitcase detonated at 31,000 feet. 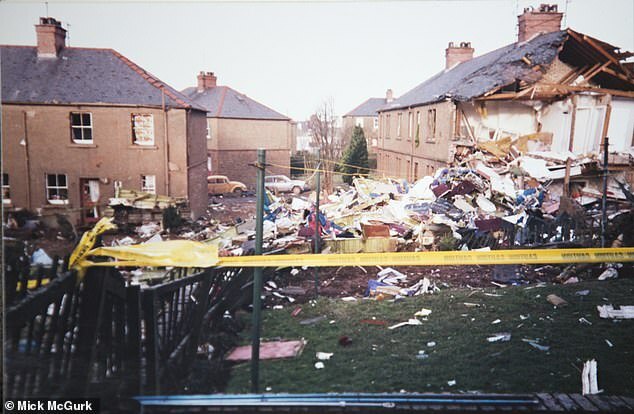 By 7.03pm, a deadly combination of mangled fuselage and burning aviation fuel had rained down upon the town of Lockerbie with lethal force, with the ensuing fireball incinerating homes in the town's Sherwood Crescent and, with it, 11 residents. Meanwhile, the bodies of the tragic passengers on board the doomed flight and their personal belongings were scattered on residential streets, surrounding gardens and the countryside around. 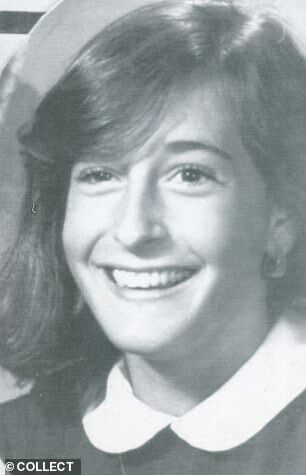 But for Mr Giesecke, now 65, the discovery that night of one of those lost souls – Lindsey Otenasek, the 21-year-old Syracuse University student who landed on his hedge in the back garden – forged an unbreakable bond of friendship with her family in the United States. To this day, Lindsey's mother, Peggy, 85, still cherishes two small pebbles from Mr Giesecke's garden she took as a permanent reminder of the spot where her daughter – the youngest of her six children - was found, and of the Scottish town which treated her and other victims with such kindness and respect. Last night, Mr Giesecke recalled the moment the families met for the first time, saying: 'About a year after the bombing, I remember working in my garden when I saw a couple standing uncertainly on the pavement outside my gate. He added: 'The garden and the area had all been cleaned up by then. The hedge was gone and there were fresh pebbles down. I showed her exactly where I'd found her and she was very grateful I could explain what happened that night. SAUDI Arabia has reportedly scrambled its military amid warnings of a coup to topple Crown Prince Mohammad bin Salman. Prince Khalid bin Farhan al-Saud, who lives in exile in Germany, said that a rival cabal has formed in Saudi Arabia. He claimed the faction has just one goal, to unseat MbS – slamming him as “ignorant and delusional”. MbS is due to become the ruler of Saudi Arabia when the 82-year-old King Salman dies. The prince already is seen by many as the de-facto ruler – and is an increasingly controversial figure following the assassination of journalist Jamal Khashoggi. Note: The Rabbi is wrong about the Ezekiel prophecy (Got and Magog war happens during the reign of Christ) but may be right about a coming Mid-East battle. Ultimately, war in the Middle East CAN NOT occur until the United States of Europe forms and gains power. That is happening NOW! Rabbi Pinchas Winston warns that the escalating conflict between Israel and Palestine could be the start of a biblical war. Following a botched Israeli special forces raid miles inside Gaza on Sunday evening, Hamas launched 400 rockets and mortars from Gaza, possibly the largest bombardment ever in that time period. Israel responded by carrying out more than 100 bombings, including the targeting of a Hamas-run television building. Saudi Arabia will retaliate against any punitive measures with an even “stronger” response, the official news agency reported, in an apparent reaction to U.S. President Donald Trump’s threats to take action over the disappearance of a prominent government critic. “The kingdom rejects any threats,” the Saudi Press Agency reported, citing an official it didn’t identify. What would the world be like if all the Muslim states banded together into a "Muslim United States ?" And we know this is going to happen! Read Daniel 11, and see about the rise of a United States of Muslim Nations that will for and become know as the biblical "King of the South." Let us just consider that all the Muslim countries somehow come together to form the ephemeral caliphate. Democracy - what's that? The states of the Arab peninsula would be the elite class of any caliphate like this and these guys know no A, B or C of democracy. Lack of democracy might not go well with all the Muslim countries. Mind you, countries like Turkey, Malaysia, Indonesia and if you consider the recent past, even Bangladesh and Pakistan are flawed but fledgling democracies. Muslims of the subcontinent, Malaysia, Indonesia and other states in the APAC region would be second class citizens in a caliphate dominated by the oil rich OPEC countries - now that's a bulk of the citizenry. Large scale exodus of smart, freedom loving, liberal Muslims to US, EU and owing to the geographic proximity, even to India. Laws are formulated by people who wield the power and by that virtue, Shariah will the defacto constitution of the caliphate. Just look at the "overwhelming" support Sharia has in all the countries and thik about the plight of population that might want to have a more liberal law structure. Blood bath! Genocidal elimination of minorities - Shias, Christians, Hindus silently put to sword. Language will be a huge issue. Not all Muslims speak Arabic. Arabic, Turkish, Urdu, Hindi, Malay, Indonesian and a plethora of other languages and dialects. Will the caliphate impose Arabic on its citizenry? We all know the consequences of that. The King of the South, talked about in Daniel chapter 11, is a leader of a United States of Islam, and may either claim to be the 12th Iman, or will designate one to his liking. This is FUTURE HISTORY, and will happen! Among the nearly 68 million people in Iran, the vast majority are Muslim who place their hope not in modern-day politics or rulers but in a person who walked the earth centuries ago and is promised to return. A majority of Shiite Muslims traditionally believe that the “12th Imam” (Islamic religious leader), born in 868 A.D., was placed by God into hiding (known as occultation) until the day of judgment. Southern Baptist author and evangelist Anis Shorrosh explained that many Shiites also refer to the 12th Imam as the Mahdi, an Arabic word that generally references a messiah, or a guide. “This man will come to show them the way, because the prayer of every Muslim five times a day … ends with ‘Show us the right path, not the path of those who have incurred your anger or those who are lost, but those upon whom grace has come,’” Shorrosh said. Though most strains of Islam have a belief in the Mahdi, Shiites traditionally believe he is Mohammed ibn Hasan, the 12th in the line of imams who were descendents of the prophet Mohammed. Though they do not know when the Mahdi will return, they believe he will come to end the misery of his people. Some strains of Islam even hold a belief that Jesus will be the Mahdi who will return and proclaim Islam as the true religion. Ray Tallman, director of the school of intercultural studies at Golden Gate Seminary, noted that the major eschatological question for Shiite Muslims is when the Mahdi’s return will take place -– and many hold the belief that the time is near. The increasing clash with Israel and that with Christianity are two indications to Shiites that the Mahdi’s return could be near, said Tallman, who spent seven years as the international director for Arab World Ministries. “All of that is sort of a sign of the times that now it has come to this, and that what is actually being done now out of hate has an eschatological sign of promise to it,” Tallman said of the Shiite view. Iranian president Mahmoud Ahmadinejad has been cited by various news sources as not only believing in the eventual return of the Mahdi, but that the return is near and that it is the responsibility of the Iranian government to prepare the country for his return. There are many in the media who are complicit in the deaths of Gazan women and children for reporting solely on the death count over the "dead baby strategy" employed by Hamas, Alan Dershowitz wrote in a column for the Washington Examiner. In the end, Hamas terrorists use women and children as human shields in the hopes that they are killed by Israeli soldiers, Dershowitz writes. With lemmings in the U.S. media who report numbers over tactics of terrorists, Hamas wins. "The goal of Hamas is to have Israel kill as many Gazans as possible so that the headlines always begin, and often end, with the body count. Hamas deliberately sends women and children to the front line, while their own fighters hide behind these human shields," Dershowitz writes. For much of this year the world has been fixated by fears of nuclear Armageddon erupting over North Korea. But over the past 48 hours, alarming developments in the Middle East remind us of the even greater likelihood of conventional warfare on a cataclysmic scale in the region. Now that its heavyweights — Israel and Iran — have traded blows for the very first time, we ignore that threat at our peril. 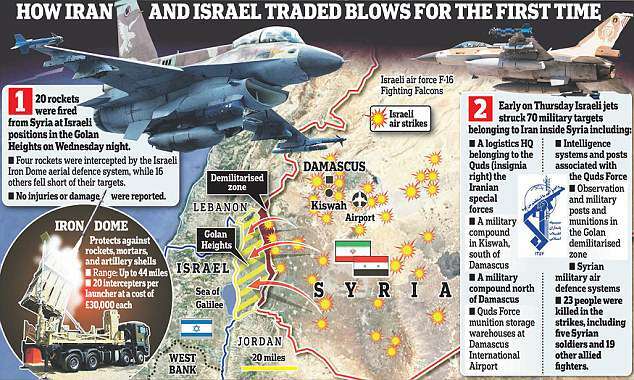 After 20 Iranian rockets were fired from Syria at military positions held by the Jewish state on the Golan Heights, Israel responded by launching dozens of missiles at Iranian forces in Syria early yesterday. They hit a radar station, air defences and an ammunition dump — killing at least 23 people, according to the Syrian Observatory for Human Rights which is based in the UK. Iran’s rockets — fired by the Quds Force, a wing of the Revolutionary Guards — either fell short of their targets or were knocked out by Israel’s ‘Iron Dome’ defence system. This is not all-out war, but it certainly takes us to the brink. In the Middle East, two major conflicts have been simmering side by side for years — the Arabs versus the Israelis, and the Shi’ite Muslims against the Sunni Muslims. This week’s events seem about to drag them together into a gigantic and highly unstable flash point. Iran, which is not an Arab nation, is the chief Shi’ite power. Since the revolution of 1979 which over threw the pro-Western, modernising Shah and imposed the harsh religious rule of the Ayatollahs, it has been spreading radicalism. The regime detests the West: it refers to America as the Great Satan, and Britain as the Little Satan. Iraq is dominated by Shi’ites, as indeed is Lebanon after Hezbollah, the para-military party allied to Iran and which loathes Israel, won this month’s general election. The Ayatollahs in Iran back the Syrian government of Bashar al- Assad. Surrounded by hostile pro-Western nations, Iran needs all the allies it can find to help protect its regional interests. Support for Syria also allows it to station forces far to the West of its own borders — closer to the Mediterranean, in fact, than it has been since the days of the Persian empire 1,400 years ago. Washington and the US media seem to have no doubts about the Syrian government’s complicity in the Douma incident despite the fact that those who want America to stay in Syria have far more solid motives, Ron Paul told RT. The assertion by White House Press Secretary Sarah Huckabee Sanders that Washington is “confident” that Syrian President Bashar Assad is culpable for the alleged chemical attack on the Damascus suburb of Douma does not stand up to scrutiny, Ron Paul, former congressman and founder of the Ron Paul Institute for Peace and Prosperity, told RT. Mainstream American media don’t seem to need facts to back the White House’s claims, either. “Most of the time when a crime is committed in this country, the stations, when they are not sure, they carefully say: ‘this is allegedly’ – but they never do this under these circumstances and they have zero bits of information,” Paul pointed out. While there are few questions in the US media over who is to blame for the alleged incident, the former congressman argues that Assad is the last person to suspect. “I think that least likely it would be Assad,”he said, noting that the same goes for Moscow. “I cannot see any reason why Assad would do this, there’s no reason for Russians to have done that.” Unlike Russia and Syria, the forces who want to see the US staying in Syria have a clear motive, Paul said. The Times of Israel reports: WASHINGTON — Defying longstanding American policy, US President Donald Trump will give a speech Wednesday recognizing Jerusalem as Israel’s capital, according to an Axios report on Friday. The Axios report cited two sources with direct knowledge of Trump’s intentions. Forward by Bob Barney: This is just the start. In the present time, this will not happen. But the Bible tells us that a third Temple will happen! When it does, you will then know that the END TIMES are very near.... Keep Watching happenings in Jerusalem. God's words are THE PLAIN TRUTH! He then went on to say “Al-Aqsa Mosque is currently in place of the temple, despite the temple being much holier than it. Al-Aqsa Mosque is only the third most holy mosque in Islam.” “Now that Israel has once again become a Jewish sovereign state, the desire to rebuild the Temple is growing stronger and strong” he added. JERUSALEM – Philanthropist billionaire George Soros has funded opposition organizations in Egypt and throughout the Middle East, where anti-regime chaos has already toppled the pro-Western leader of Tunisia and is threatening the rule of President Hosni Mubarak, a key U.S. ally. Mohamed ElBaradei, one of the main opposition leaders in Egypt, has also sat on the board of an international "crisis management" group alongside Soros and other personalities who champion dialogue with Hamas, a violent offshoot of the Muslim Brotherhood. The Brotherhood, which seeks to spread Islam around the world in part by first creating an Islamic caliphate in Egypt, now backs ElBaradai, who has defended the group in the news media the last few weeks. ElBaradei suspended his board membership in the International Crisis Group, or ICG last week, after he returned to Egypt to lead the anti-Mubarak protests. Soros is one of eight members of the ICG executive committee. U.S. board members include Zbigniew Brzezinski, who was national security adviser to Jimmy Carter; Samuel Berger, who was Bill Clinton's national security adviser; and retired U.S. ambassador Thomas Pickering, who made headlines in 2009 after meeting with Hamas leaders and calling for the U.S. to open ties to the Islamist group. Another ICG member is Robert Malley, a former adviser to Obama during the 2008 presidential campaign who resigned after it was exposed he had communicated with Hamas. WND first reported Malley had long petitioned for dialogue with Hamas. TURKEY: East, West or Neither? Turkey has a continuous identity crisis. It encompasses a land bridge that connects Europe with the Middle East, and its inhabitants have always been torn between identifying with its eastern Muslim neighbors and western trading partners. Until recently, this predominantly Muslim nation leaned west. It allied with Israel; it joined nato; it sought membership in the European Union; it became an important partner of the United States in the then-called war on terror. Now, though, that has all changed. Since 2002, when the Justice and Development Party (akp) came to power under Islamist Prime Minister Recep Tayyip Erdoğan, this once secular republic has turned to its Islamic roots. When Erdoğan was elected to a third term by a landslide in June, Barry Rubin, director of the Global Research in International Affairs Center, said that the nation’s future is certain: “[N]ow Turkey is set on a path that is ending the republic established by Kemal Ataturk in the 1920s. The Turkey of secularism and Western orientation is finished. … In short, the akp is entrenched in power, and can now proceed with the fundamental transformation of Turkey” (Jerusalem Post, June 13). Is Rubin correct? Is Turkey ready to abandon its connection to Europe and its friendship with the U.S. to cozy up to its Muslim neighbors? Turkey, the core of a great empire that once ruled the biblical Promised Land for 400 years, is a regional power that profoundly affects Israel. Therefore the Bible, a book that prominently features Israel and its relations with major nations, must not be silent about Turkey. In fact, the Bible has many thunderous prophecies about Turkey, and the only way to understand them is by knowing where this nation is identified in those prophecies. So who is Turkey in biblical prophecy? For the answer, we must look at its ancient and modern history. Turkey will be a key Player in the upcoming event called the “Great Tribulation.” What will Turkey do to the modern Descendants of Israel? How will God judge Turkey? The Turks are a partner in NATO. They have a political relationship with the Israelis. The Bible says that these current conditions will end, and Turkey will soon become an enemy of both the USA and the Jews. Turkey Identified in the Bible. So where is Turkey in the Bible? Can Turkey be traced back to the Edomites of the Bible? In the Book of Genesis, Isaac and Rebekah had twin sons, one Jacob and one Esau. She asked God what was going on inside her during the time of her pregnancy, and God said, “And the children struggled together within her; and she said, If it be so, why am I thus? And she went to inquire of the LORD. “And the LORD said unto her, Two nations are in thy womb, and two manner of people shall be separated from thy bowels; and the one people shall be stronger than the other people; and the elder shall serve the younger.” (Gen 25:22-23). Esau, when he came out was “Red” like a garment (25:25), therefore inherited the name Edom (25:30). When it came time for the birthright to be handed down, Jacob’s mother Rebekah made sure Jacob received it instead of Esau, see Gen 27. When Esau came after the blessing was given, Esau begged for a blessing as well. Isaac then prophesied, “...Behold, thy dwelling shall be the fatness of the earth, and of the dew of heaven from above; “And by thy sword shalt thou live, and shalt serve thy brother; and it shall come to pass when thou shalt have the dominion, that thou shalt break his yoke from off thy neck”(Gen 27:39-40). So there is no reason why this prophecy of Esau shouldn’t take place during the same time.Esau’s blessing is explained, “At length, in reply to the weeping suppliant, he bestows upon him a characteristic blessing. ‘Away from the fatness.’The preposition (ימm y) is the same as in the blessing of Jacob. But there, after a verb of giving, it had a partitive sense; here, after a noun of place, it denotes distance or separation;for example, Prov 20:3 The pastoral life has been distasteful to Esau, and so it shall be with his race. The land of Edom was accordingly a comparative wilderness (Mal 1:3). ‘On thy sword.’ By preying upon others.”(Barnes Notes,emphasis added). Esau will be separated from the blessings of Jacob;instead they would be a warrior people, and not a people to be fruitful whatsoever. The rest of this prophecy will be explained later in the article. Esau married into the Hittite race, “And Esau was forty years old when he took to wife Judith the daughter of Beeri the Hittite, and Bashemath the daughter of Elon the Hittite:”(Gen 26:34) . The Hittites were a Mongolian race of Kittim mixing with the sons of Heth of Canaan. “The Hittites as shown both on their own and on Egyptian monuments were clearly Mongoloid in type. They were short and stout, prognathous, and had rather receding foreheads. The cheek bones were high, the nose was large and straight, forming almost a line with the forehead, and the upper lip protruded. They were yellow in color, with black hair and eyes, and beardless, while according to the Egyptian paintings they wore their hair in pigtails, although this characteristic does not appear in the Hittite sculptures. They would seem to have come, therefore, from the northeast of Mesopotamia, and to have worked south into Palestine and west into Asia Minor” (Jewish Encyclopedia under “Hittites”). For more details on the Hittites read our booklet China in Prophecy. Esau alsomarried a daughter of Ishmael, see Gen 28:8-9. Read the entire publication HERE in PDF format! Defiant Turkish civilians reclaimed the country from their own military after helping to end a coup by the army to overthrow President Recep Tayyip Erdogan, who called on people to remain on the streets today over fears over a fresh uprising. 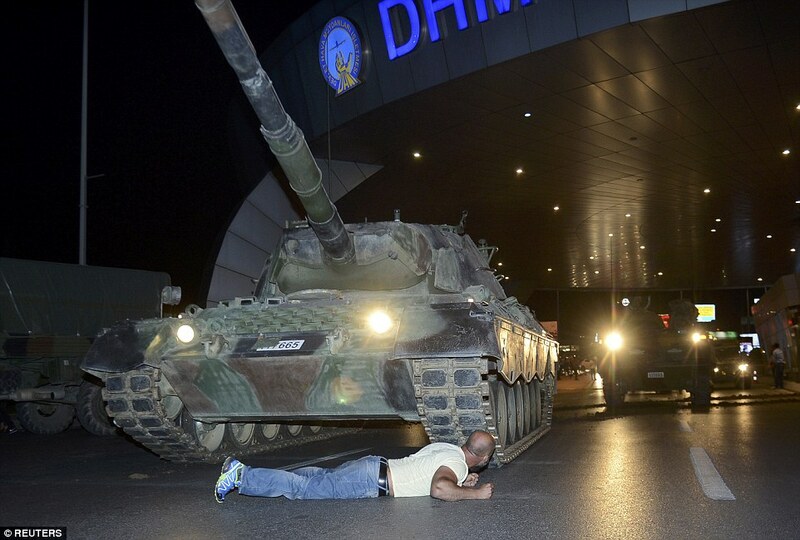 Ordinary Turks confronted rifle-wielding soldiers, climbed atop tanks and laid in front of military vehicles in an effort to take back control of the country, ignoring a curfew issued by coup plotters designed to allow the army to bring down the government unopposed. President Erdogan called on people to take to the streets, leading to reports of groups of soldiers surrendering at several key locations in Ankara and Istanbul, including Bosphorus Bridge, where 100 rebels laid down their arms and submitted themselves to advancing civilians and police officers. 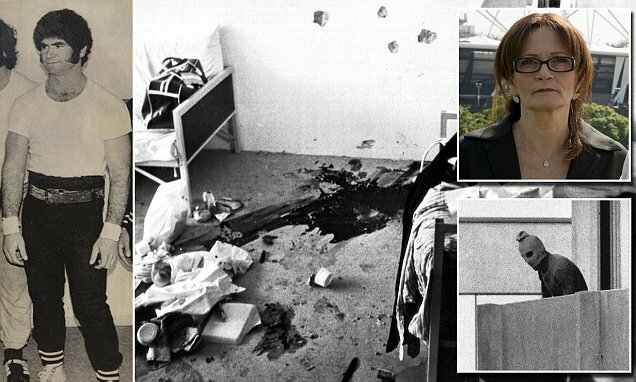 Some 104 plotters were killed after a coup attempt to bring down the Turkish government, while 160 people - at least 41 of them police and 47 civilians - fell as 'martyrs'. Throughout the night, supporters of Erdogan threw themselves in front of tanks at key landmarks to prevent the military from maintaining a stranglehold on the country, notably outside Ataturk airport in Istanbul, where some civilians lodged themselves under the wheels of tanks to stop them from advancing. More than 2,800 rebels have been detained after their failed military coup that killed at least 250 and wounded more than 1,500, with Erdogan vowing revenge for the bloody uprising. BRITAIN EXITS THE EU! The Shite just hit the fan! For almost 200 years, those who knew the identity of the British people in Bible prophecy have been "getting it right" when it comes to predicting world events, especially those that concern Europe. Herbert Armstrong, and his son Ted were predicting the formation of The United States of Europe for over 75 years! At first they were ridiculed for not having a clue. They did have a clue however, it was the Bible and the knowledge of who was who in today's world - or where did the nations mentioned in the Bible go. When the Armstrong's were predicting the formation of the United States of Europe, they made it clear that when the BEAST of REVELATION takes over control of Europe, ENGLAND, FRANCE, The Netherlands, Denmark and the Scandinavian countries WOULD NOT BE A PART OF IT! Why did they say this? Because they knew who those people were, from the pages of the Bible: Those countries are the descendants of "The Lost 10 Tribes of Israel." Britain is the tribe of Joseph (so is the USA), France is Reuben, Holland is Naphtali, Denmark is Dan - in fact it is really spelled DANMARK - just read that name on any product made there. For months now, I knew that the UK would be leaving the EU because I know the identity of the people, and what the Bible says about them. Do you realize that the stone that sits under the throne of the monarch of England is the same stone that Jacob used as a pillow! The original "My Pillow" was Jacob's pillow, a sacred stone on which God gave him a vision of the future of his descendants! The same rock was used by every king of ancient Israel in the coronation ceremony. The same rock was carried by the prophet Jeremiah to Spain, then to Ireland, where every single Irish monarch was coronated over! The same rock was later brought to England where every monarch there including Queen Elizabeth was coronated over! 1) Europe is going to be plunged into a major depression - probably worse than that of the 1920's which gave rise to Mussolini and Hitler. Most the of the democratic nations there will fall, as the people will demand a strong man to lead them out of the depression. 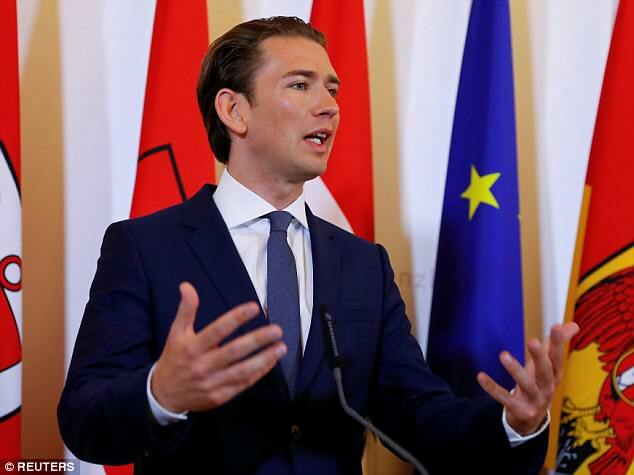 2) The Holy Roman Church will ally with this new leader which will unite Europe (all the nations - except "Lost Israel.") into another "Axis-type" power. That leader is the Antichrist - The nation formed will be a 10 nation kingdom made up of Germany, Austria, Greece and Italy. The leader will probably be German, but possibly Italian. 3) The new United States of Europe will dominate the world! The USA, the other nations of Lost Israel, and the modern Jewish state will fall under the dominance of this satanic leader. Only the Muslim world (The King of the South in the Book of Daniel) will oppose him. He will declare war on the Muslim world and at least 1 BILLION Muslims will be killed! 4 These witnesses are the two olive trees and the two lamp stands standing in the presence of the Lord of the earth. 5 If anyone wants to hurt them, fire comes out of the witnesses’ mouths and burns up their enemies. If anyone wants to hurt them, he must be killed the same way. 6 These witnesses have authority to shut the sky in order to keep rain from falling during the time they speak what God has revealed. They have authority to turn water into blood and to strike the earth with any plague as often as they want. 7 When the witnesses finish their testimony, the beast which comes from the bottomless pit will fight them, conquer them, and kill them. 8 Their dead bodies will lie on the street of the important city where their Lord was crucified. The spiritual names of that city are Sodom and Egypt. 9 For 3½ days some members of the people, tribes, languages, and nations will look at the witnesses’ dead bodies and will not allow anyone to bury them. 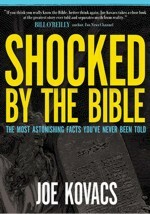 10 Those living on earth will gloat over the witnesses’ death. They will celebrate and send gifts to each other because these two prophets had tormented those living on earth. 11 After 3½ days the breath of life from God entered the two witnesses, and they stood on their feet. Great fear fell on those who watched them. 12 The witnesses heard a loud voice from heaven calling to them, “Come up here.” They went up to heaven in a cloud, and their enemies watched them. 13 At that moment a powerful earthquake struck. One-tenth of the city collapsed, 7,000 people were killed by the earthquake, and the rest were terrified. They gave glory to the God of heaven. 14 The second catastrophe is over. The third catastrophe will soon be here. Notice some important facts about these two witnesses. It says for 3 1/2 days THE ENTIRE WORLD will view their dead bodies! How could that have ever been done before the age of satellite TV? CNN, FOX and the news of the world will give us live coverage of their dead bodies! ----- Notice also that the world will be happy that they are dead! That includes Britain and America! There is a simple reason. Modern mankind is at war with God, and refuses to follow the Law of God! For that reason, the world will be punished by these two men. Queers will not be celebrated as an alternative life style. Man's religions are not God's.... They are all part of the Satanic great false church of Babylon. Man's holy days are not God's holy days. God abhors Christmas and Easter! In fact, read the verse above: 9 "For 3½ days some members of the people, tribes, languages, and nations will look at the witnesses’ dead bodies and will not allow anyone to bury them. 10 Those living on earth will gloat over the witnesses’ death. They will celebrate and send gifts to each other because these two prophets had tormented those living on earth." Notice those words underlined. The world will give gifts to one another at the death of God's Holy Men. When do people exchange gifts? CHRISTMAS! This verse seems to imply that this brutal attack will happen during Christmas time. Don't be fooled by the pundits on the news! Or by false ministers who preach "another Jesus". Trust what God is telling you in the Bible! Bible events are unfolding in front of our eyes. WAKE UP! REPENT and turn away from SIN- or you will receive the mark of destruction! God says in Ezekiel: "Do you think that I like to see wicked people die? says the Sovereign LORD. Of course not! I want them to turn from their wicked ways and live Turn! Turn, Turn from your lawlessness, O people of Israel! Why should you die?" America, stop calling evil good and good evil! If you continue to refuse - you will die horrible deaths. Listen and obey the voice of GOD! It is not to late for you. The Number "13" and the Identity of "Ephraim"! IRAN, WORLD POWERS REACH FINAL NUCLEAR DEAL- What The Bible Says! Perhaps you didn’t know that the Saudis already have nukes! Saudi Arabia already has nukes, Iran probably does, and the Russians are one of the two great nuclear powers on the entire planet. So if Saudi Arabia, Turkey and their Sunni allies do decide to conduct a full-blown ground invasion of Syria, could someone ultimately decide to use nuclear weapons when their backs get pushed up against a wall? As you read this article, there are thousands of military vehicles and hundreds of thousands of troops massed along the southern border of Turkey and the northern border of Saudi Arabia. If the command is given and those forces start streaming toward Damascus, it is inevitable that the Syrians, the Iranians, Hezbollah and the Russians would fight back. It would literally be the start of World War 3, and the Saudis and the Turks are trying very hard to convince the United States to be involved. But the truth is that we don’t want any part of this conflict, because it could very easily become the very first nuclear war in the history of the Middle East. ISIS Says There’s Only One Country They Fear - It's not Us! A German journalist who spent 10 days with the Islamic State group and came out unharmed told a British Jewish news site that the jihadist fighters told him that the only country they fear is Israel. 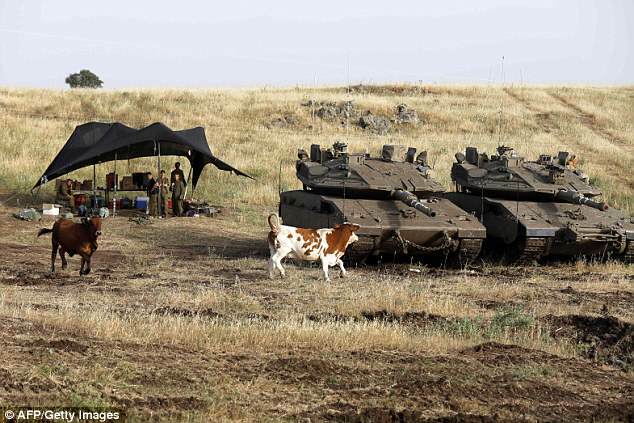 “They told me they know the Israeli army is too strong for them,” journalist and former member of German parliament Jurgen Todenhofer told the U.K.’s Jewish News. “They are not scared of the British and the Americans,” Todenhofer said. “They are scared of the Israelis and told me the Israeli army is the real danger.” He added that Israel Defense Forces can fight a guerrilla war. The journalist said that the Islamist militants told him they hope to lure Western forces into Iraq and Syria where they could then kidnap American and British soldiers. Todenhofer told Jewish News that the Islamic State was “preparing the largest religious cleansing in history” and that while they are prepared to accept Christian and Jewish citizens in exchange for the payment of a jizya tax, the fate for Shi’ite Muslims is death. It didn't start with ISIS! As the world moves closer to ratifying a nuclear deal that Jerusalem says won’t keep Iran from obtaining a nuclear arsenal, Ya’alon told German newspaper Der Spiegel that Israel would do anything necessary in order to assure Tehran does not get atomic weapons, including taking military action. “Ultimately it is very clear, one way or another, Iran’s military nuclear program must be stopped,” Ya’alon said, according to a retranslation from an interview published in the German daily. 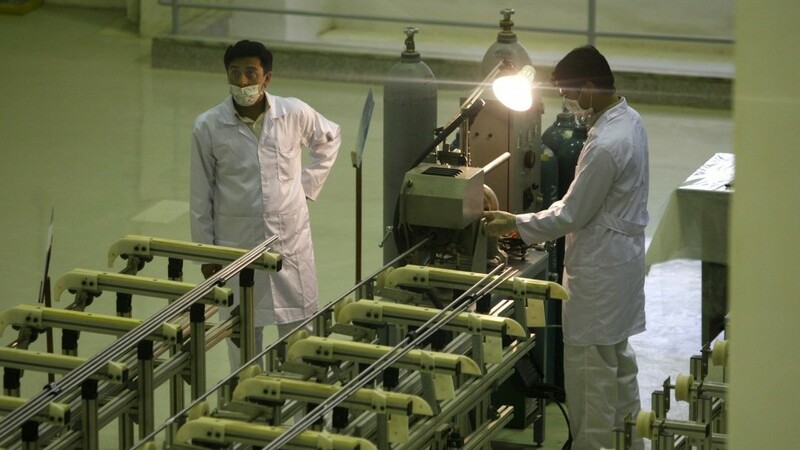 “We will act in any way and are not willing to tolerate a nuclear-armed Iran. We prefer that this be done by means of sanctions, but in the end, Israel should be able to defend itself,” the defense minister said. He added that he was “not responsible for the lives of Iranian scientists,” according to Der Spiegel, which will publish the full interview on Saturday. Ya’alon further stated that Israel was considering carrying out airstrikes on Iranian military facilities, the German paper reported.